Regiment/Catrawd: 7th Battalion, Royal Welsh Fusiliers. Service Rank and Number / Rheng gwasanaeth a rhif: Private No. 291464. Military Cemetery/Memorial / Fynwent milwrol: Kantara War Memorial Cemetery. Ref No Grave or Memorial / Rhif cyfeirnod bedd: E. 334. Country of Cemetery or Memorial / Gwlad y fynwent neu gofeb: Egypt. Died of wounds on Sunday 11 November 1917, aged 28 years. Elias Robert Williams was born in Corris, Merionethshire, Wales in 1889. The 1901 Census shows that the family lived at 98 Beach Road, Athog, Merionethshire. The head of the family was John Williams aged 40, who was employed as a Slate Miner. His wife Anne Williams aged 36 and their three sons – Elias Robert Williams aged 12, William Rhys Williams aged 11 and John Hope Williams aged 7 years. By 1911 Elias was employed as an Assistant School Teacher at Rhyl Council School and lived at 9 Bridge Street, Rhyl, Flintshire, North Wales. On 13 April 1914, Elias’s father John Williams died aged 53. His mother Anne Williams died on 1 August 1916, aged 51 years. On Tuesday 7 December 1915, Elias enlisted at the Recruitment Centre, Rhyl with 7th Battalion, Royal Welsh Fusiliers. His Short Service Attestation Certificate states that he was 26 years 11 months of age and employed as a School Teacher. He was described as 5′ 5″ tall, Chest Measurement 33″ with a 2″ Expansion. His physical development was described as good and he was passed fit for Military Service. On Monday 3 July 1916, the Battalion as part of the Egyptian Expeditionary Force arrived in Egypt. Elias died of wounds received in action on Sunday 11 November 1917. The only item of property recovered from his body was his Identity Disc which was later returned to his brother William Rhys Williams. 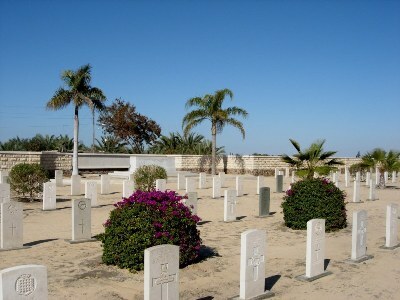 Kantara War Memorial Cemetery, Egypt. On 18 May 1918 payments of £2. 0s.0d were made to John Hope Williams, William Rhys Williams and Lewis Williams, being monies owed to their brother Elias. On 23 December 1919, a further payment which is recorded as a War Gratuity of £8. 0s.0d. was also made to John Hope Williams. Liverpool Daily Post Newspaper 3 December 1917 – Private Elias Robert Williams. ‘News has been received in Rhyl of the death from wounds received in action in Palestine, of Private Elias Williams, Royal Welsh Fusiliers. He was a native of Corris, and before joining the colours was Assistant Master at Emmanuel Council School, Rhyl. He had intended studying for the Ministry after the war. 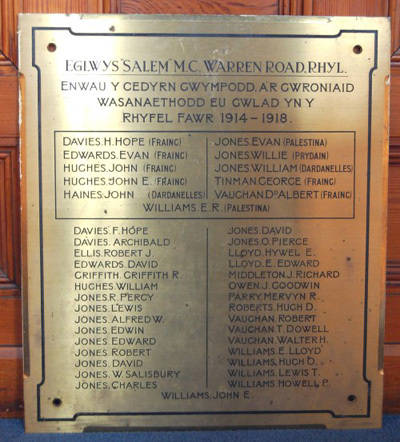 Remembrance Plaque at Warren Road Methodist Church, Rhyl, Flintshire.